If Congress approves the U.S. 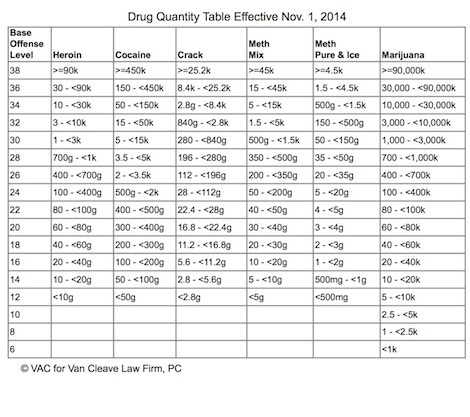 Sentencing Guideline amendments (and its deadline to do so is November 1, 2014), here is what the drug quantity table will look like effective November 1, 2014. (Amendment 782 is the official number of the amendment that will change the drug quantity table.) Click on the image for a full-size, downloadable PDF file. For a fuller explanation, see our “Drug Minus Two” page. As one might guess by the nickname “Drug Minus Two” or “All Drugs Minus Two”, the main difference between the new drug quantity table and the old is that, in general, the same quantity of drugs will compute to two fewer levels on the new table than on the old table. The second real change is that the threshold of drugs needed to get the highest guideline level, level 38, are new values; for example, now a charge must involve 28.2 kg of crack or more in order to earn a guideline level 38. Third, there is a corresponding change for small quantities of drugs in that the threshold required to get the lowest guideline level for that substance is higher. Under the old table, less than 1.4 g of crack corresponded to guideline level 12, and under the new table, less than 2.8 g of crack corresponds to guideline level 12; but a charge involving 1.3 g of crack will still earn guideline level 12, not guideline level 10. Courts will begin to accept motions to reduce sentences under Amendment 782, or “Drug Minus Two” (the type of motion that is to be filed is a motion under Section 3582(c)(2)) on November 1, 2014. No inmate will be released under this rule until November 1, 2015. Although, technically, an attorney does not have to be hired to file such a motion (just as an attorney is not required at trial or sentencing, as anyone may represent themselves at any point in a criminal case), it is a good idea to have experienced counsel represent the inmate. The chances for getting time off one’s sentence are much higher if one retains an attorney with extensive experience in post-conviction motions, especially in a “hard” case, where opposition by the Government is expected. If you have any questions, you can call our firm at (512) 693-9LAW or email us. Just click on the “Contact Us” link here or at the top of the page, and we would be glad to talk to you about your matter.